Charles Sanders Peirce (1839–1914) was an American philosopher, physicist, mathematician, and the founder of pragmatism. Despite his importance in the history of philosophy, a unified statement of his thought has been unavailable. With this publication, readers at long last are offered the philosopher’s only known, complete, and coherent account of his own work. 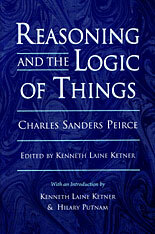 Originally delivered as the Cambridge Conferences Lectures of 1898, Reasoning and the Logic of Things is the most accessible and thorough introduction to Peirce’s mature thought to be found within the compass of a single book. Beginning with an explanation of the nature of philosophy, Peirce proceeds to illustrate his claim that mathematics provides the foundation of our logic and metaphysics. We find here the clearest formulation of an idea present in Peirce’s thought since the 1860s, the distinction between three kinds of reasoning: induction, deduction, and retroduction. Then follows an introduction to Peirce’s chief logical doctrines, as well as his attempts to provide a classification of the sciences, a theory of categories, and a theory of science. In conclusion, turning from “reasoning” to the “logic of things,” Peirce called for an evolutionary cosmology to explain the reality of laws and described the kinds of reasoning he employed in developing this cosmology. At the urging of his friend William James, Peirce made an uncharacteristic effort in these lectures to present his ideas in terms intelligible to a general audience—those without advanced training in logic and philosophy. The introductory materials by Kenneth Ketner and Hilary Putman add to the volume’s lucidity. Consequently, this book will be a valuable source for readers outside of the circle of Peirce specialists.